Moving to a big bed can be a big step for kids. The Safety 1st Portable Bedrail is designed to make that change a little easier. This clever bedrail protects little ones from bedtime tumbles, forming a barrier between your sleeping toddler and the drop to the floor. The Safety 1st Portable Bedrail helps kids to feel safe and secure in their own bed. The Safety 1st Portable Bedrail can fold down to bed level, so it’s still easy for little ones to climb into bed. 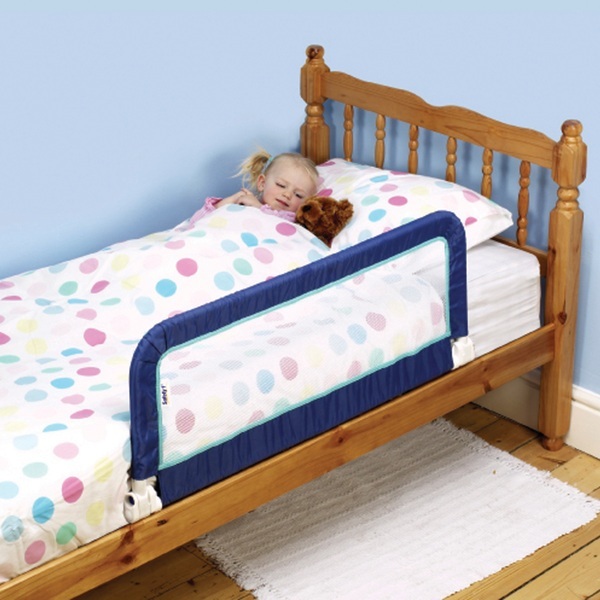 The bedrail is suitable for use with both standard and slatted beds, so you can keep your child feeling secure whatever the bed. It’s foldable and portable enough to take on trips away from home too! The Safety 1st Portable Bedrail makes sleeping in their own bed a safe experience for kids. Perfect for little ones who are just moving up to their first big bed, the soft and secure bed rail gives security and peace of mind to young children and parents alike. This bedrail extends from 65 to 107cm wide and is compatible with attresses 156cm long and 10-24cm deep.